Size of Baby: According to Baby Center, she’s about the size of a mango…a little over a pound and about 11 inches long! Total Weight Gain/Loss: Honestly didn’t weigh myself this week…last time I checked I was up about 6 or 7 pounds. 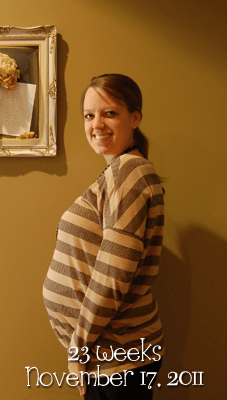 Maternity Clothes: Pants are a must…Bella Band or the rubber band trick is required if I don’t wear maternity pants. Shirts are slowly becoming necessary too. If they were loose fitting before pregnancy I can probably still get away with them, but a lot aren’t fitting! I’m finally getting to test out some of my winter maternity shirts this week and I love them! Sleep: Not bad, but the pregnancy pillow is a must. I roll over on my stomach without it! What I am looking forward to: Having a WHOLE week off next week to get some details of the nursery knocked out! Symptoms: I’ve been sick a few times this week, early in the morning…I think it’s from taking my vitamin too late at night though. Besides that, not much of anything! Best Moment This Week: Going to our child birth class last Saturday and getting some of the nursery finished!